Don Luigi, an Italian street food company started by 3 friends, is popping up at Stage 3 at the Hackney Empire Mare Street from Weds 17th to Sat 27th February, serving Weds-Sat only. Expect dishes like Calamari Cones, BBQ Arrosticini Skewer, and Pesto Lasagna, with no dishes priced at more than £8. Plus there will be jazz playing on some nights. You can get tickets from YPlan (links below) or just visit on the nights. "DON LUIGI are proud to announce their launch of ‘ITALIAN FOOD WEEKS’. The anticipated event will showcase mouth-watering Italian street food from the 17th of February until the 27th, and the pop up restaurant will be held at STAGE 3, an exciting and trendy venue, located at 291 Mare Street in London. 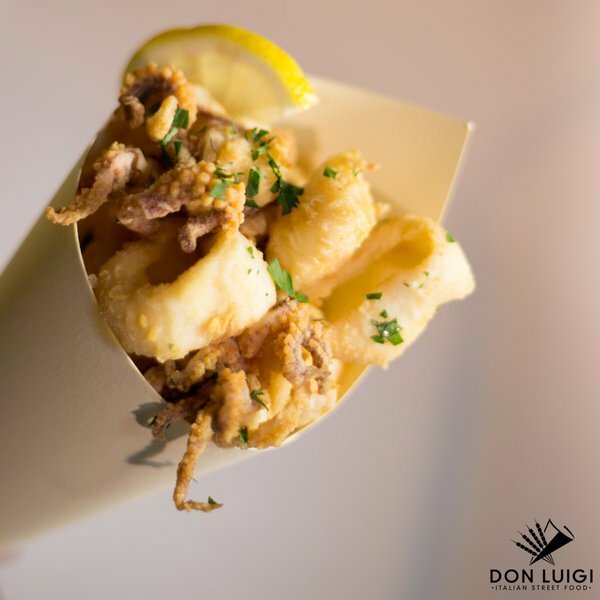 DON LUIGI is a new creative street food business which aims to fuse the convention of street food trading with delicious dishes that originate from Italy. The concept of street food means you can experience the traditional flavours of Italy at your convenience, in a fun and modern setting. Their menu features a variety of original Italian dishes which range from their refreshing Fried Calamari Cones to BBQ Arrosticini Skewers, (succulent mutton skewers which are cooked over a Charcoal BBQ and accompanied by sourdough bread soaked in extra-virgin olive oil and rosemary roasted potatoes) to their delicious Pesto Lasanga. What is more exciting is that this unforgettable menu is so reasonably priced, ensuring that no dish is priced higher than £9!"